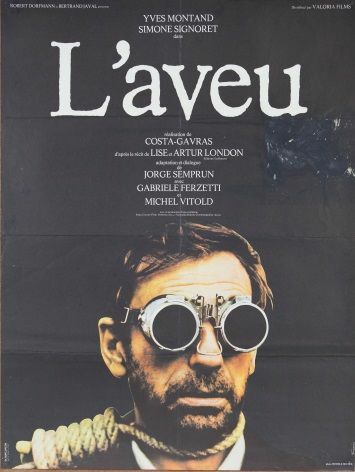 Vintage French movie poster promoting the film L'aveu which translates to english as confession. In 1950s communist Czechoslovakia, government minister Artur London (Yves Montand), a war veteran who has long been a loyal party man, leads a relatively comfortable life with wife, Lise (Simone Signoret). However, he soon finds himself under surveillance, then under arrest. He has no idea what his offense is, but agents for the totalitarian regime interrogate and torture him, aiming to use their unending power to gain a false confession for supposed crimes against the state.